Before replacing a flat roof, homeowners should keep themselves well-informed about the costs. 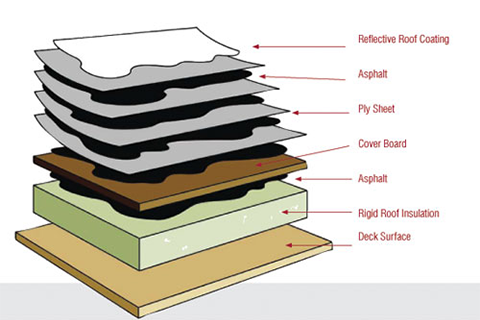 This article provides information about the most common flat roof technologies and how these technologies compare in price and style. As with shingle roofing, it is difficult to provide an estimate for the cost and prices of flat roof replacement without an evaluation of your home's specific needs and issues. However, the cost of replacing a flat roof does not vary as widely as prices for shingle roofing. Most flat roof materials tend to come with lower prices than shingle roofing, and installing a flat roof is much less labor intensive than installing a conventional pitched roof. The average costs provided here are for a two-story, 2,300 square foot house. Otherwise known as tar and gravel roofing, this is the cheapest material on this list. In addition to low costs, these roofing systems provide excellent waterproof protection, as well as protection against UV damage. Built-up roofing also features fire resistant gravel and is a low-maintenance style of roofing, which can help keep prices and costs down. However, built-up roofing is also very heavy, and so homeowners should find a contractor to evaluate their roofing structure before moving forward with installation. Built-up roofs can be difficult to install, with a slower, messier, often more hazardous installation process. The cost of tar and gravel roofing is $3.50-$7 per square foot, and prices for a new roof are $12,000. This type of roofing is made from asphalt, as well as a variety of rubber modifiers and solvents. Homeowners may be able to install self-adhering (peel-and-stick) modified bitumen systems on their own, though it is recommended that they seek professional help for any kind of roof installation. Torch-down modified bitumen systems are fire hazards and this type of flat roof installation is very dangerous without a professional's help. The price for modified bitumen is generally $3-$6 per square foot, and the average price for full roof replacement is about $10,300. Though rubber roofing is the most expensive material for your flat roof, it is also the most durable and is preferred by a majority of contractors. 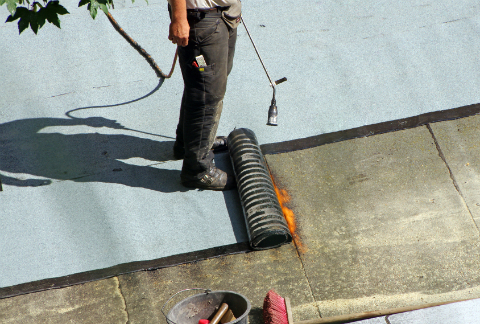 Rubber roofing is highly resistant to scuffs and tears, and leaks in this type of roofing are very easy to patch. Rubber roofing costs $10-$20 per square foot, while the average cost for fully replacing your flat roof is $18,500. Homeowners should avoid replacing any kind of roof by themselves. In particular, homeowners are strictly advised against replacing tar-and-gravel roofing or modified bitumen torch-down roofing without the help of a professional contractor. Homeowners who attempt these tasks without a professional may subject themselves to severe danger, including bodily harm and the possibility of burning down their houses. Take your time when gathering cost and price estimates from contractors and researching the different materials for your roof. Be sure that your contractor can provide you with professional recommendations from previous jobs. If you choose to go with a built-up roof or modified bitumen, your contractors should be familiar with the safety requirements for this kind of roof installation. To find a qualified contractor who can help you replace your flat roof, check out HomeAdvancement's database of contractors.